Bacon and Tomato Pasta Stir Fry (pictured). 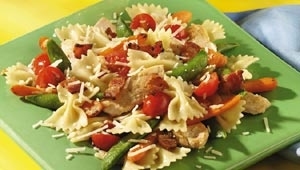 Bow tie pasta, bacon, chicken, cherry tomatoes, and sugar snap peas topped with Parmesan cheese - yum! Bow tie pasta, green beans, and cherry tomatoes tossed in pesto and topped with Parmesan. A rich and classic ‘bacon and egg’ pasta dish. This recipe could also be served for brunch. A nice kick up for plain old coleslaw. A tasty lower fat version of the classic recipe. I like to serve with chicken breasts and broccoli. So easy to make and great for a comforting meal.